Prominent & Leading Manufacturer from Bengaluru, we offer grading machine with elevator, onion grading machine, lemon grading machine, frozen fruit & vegetable grading shaker and gherkin rope grading machine with conveyor system. Riding on unfathomable volumes of industrial expertise, we are offering an excellent range of Grading Machine With Elevator that is mainly used in food processing industries. Being a quality-oriented organization, we assure our clients that this machine is best in quality. Our skilled professionals only utilize fine quality raw material, while manufacturing the entire range of machine. Moreover, our offered machine can be availed in a wide range of sizes and specifications, as per the requirements of our esteemed clients. 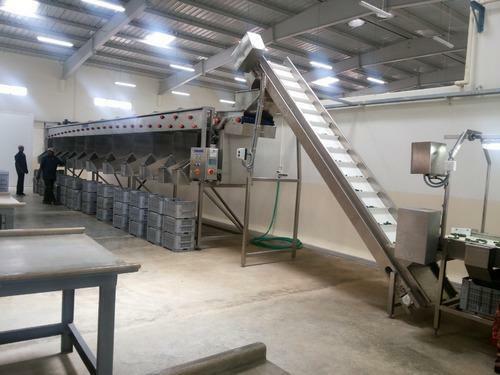 Our reputation in the market is largely attributable to our precision-designed Onion Grading Machine from our extensive collection of products. Ideal for grading onion, this line is manufactured using excellent quality raw material and latest technology by our skilled professionals. In order to ensure quality, this line is stringently tested on various parameters by our experts. 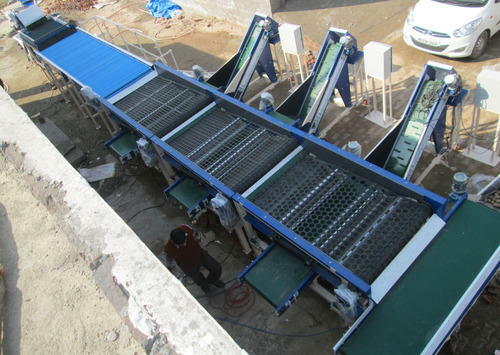 Apart from this, remarkable quality and sturdy structure increase the demand of our offered line in the market. We manufacture and supply various types of grading machine for grading various types of fruits and vegetables like Rope Grading Machine, Vibratory Grading Machine, Cage Type Grading Machine, Drum Type Grading Machine, and Roller Type Grading Machine suitable to the customer requirement. 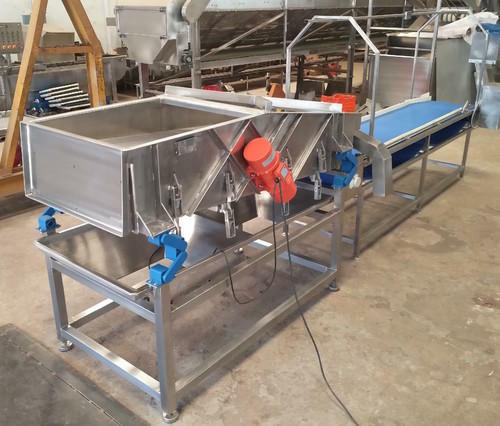 Avaiable in SS food grade and MS.
Our in-depth knowledge and industrial expertise enable us to offer a distinguished range of Lemon Grading Machine Line. We manufacture this line by making use of high-grade raw material and high-end technology so as to maintain the set industry standards. To make a flawless dispatch from our end, our offered line is rigorously inspected by our quality inspectors against various parameters. This line is broadly acknowledged by our clients for its easy usage and sturdiness. With the aim of meeting diversified needs of our esteemed clients, we are devotedly affianced in offering a wide gamut of Frozen Fruit Vegetable Grading shaker.The offered range is widely used in various food processing industries to remove and separate unwanted material and mainly sort and grade round diced pappaya,mango,melon etc fruit and vegetables as per the customer required sizes.suitable sieves supplied as per the customer and process requirement. 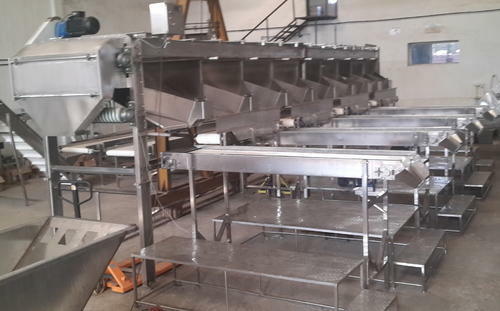 The offered Frozen Vegetable Fruit Grading Shaker is provided in different sizes as per the patron’s various needs and requirements. Being a client-centric organization, we are engaged in offering a distinct collection of Gherkin Grader with Conveyor System. 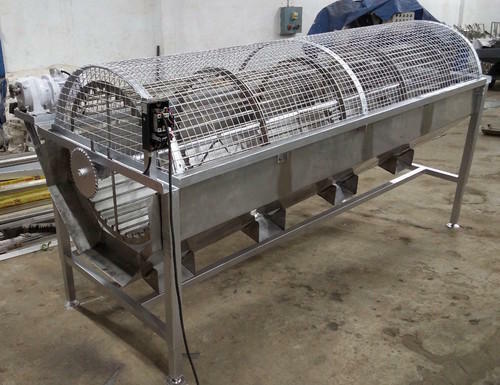 Our skilled professionals manufacture this system using well-tested raw material and sophisticated technology. In addition to this, our offered system is rigorously tested by our quality controllers against diverse parameters in order to deliver a defect-free range at clients end. Moreover, the offered system is extensively appreciated by our clients for featuring variegated attributes like easy installation and durability. Looking for “Vegetable and Fruit Grader”?